The mud from the river stacks up at Sossusvlei and after some 1000 years the river searches its way through the next row of dunes. This is how the place called Dead Vlei was created, here the river used to drain away many years ago. 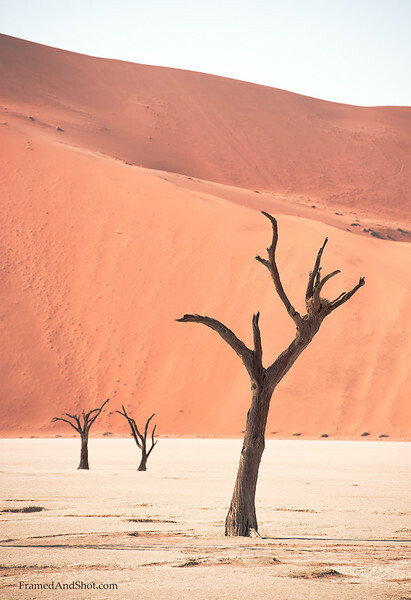 Because of the lack of water all the trees in this valley have died, so the meaning of "Dead Vlei" becomes clear. What makes the sight of the Dead Vlei so remarkable is that there is not even moisture enough for normal decomposition to occur. So all the trees here, though dead, have been nearly perfectly preserved for centuries.